It’s a common question at the golf course. The common wise cracking response from the golf professional is “High or Low?” But the true answers for both courses involve interesting numbers and stories. On the Championship Course, the record is a 10 under par 61 by Kyle Perry. 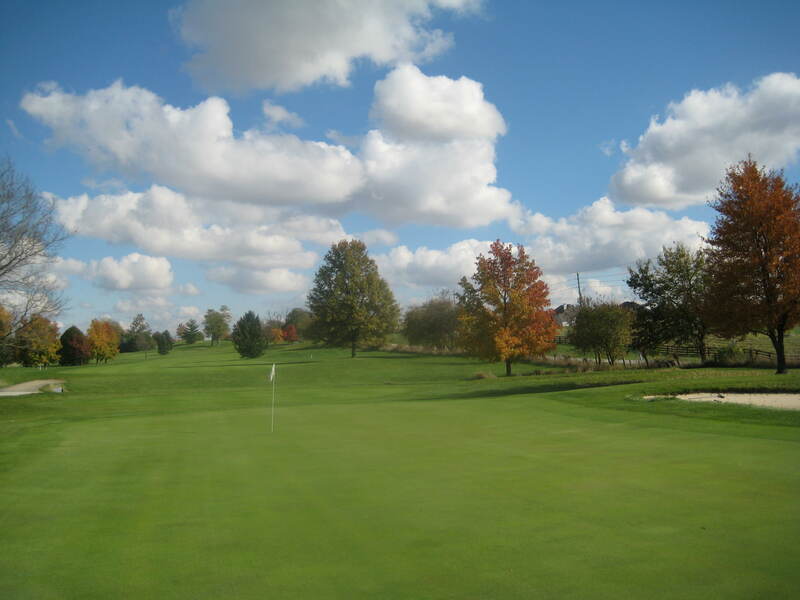 On June 11th 2010, the Indiana Public Links Championship began at StonyCreek. The two day, 36 hole tournament is for Amateurs not affiliated with a Private Club. In other words, it’s designed to determine the best public course player. In 2010, Kyle was just 20 years old but an accomplished amateur player. He started the round by birdieing 9 of the first 11 holes, an incredible feat on its own. Surprising to those at StonyCreek was that it was holes 4 and 5 that he did not birdie, the 2 shortest par 4’s on the front side. He would cool off just a bit and make just one more birdie, but no bogeys. In all, it was 10 birdies and 8 pars, and a round that would be impressive on any day on any course. Long time StonyCreek player Paul Bates was paired with Kyle that day and remarked that he just seemed to make every putt all day long. At day’s end, Kyle had a 6 shot lead and the new course record (the previous known record was by former tour player Jeff Leonard with a 62). He would eventually make a bogey by the 14 hole on day two of the tournament but still shoot 69 and win the Championship by 3 shots. A Trophy and a record in the same weekend, that’s not too bad, especially for a young man of just 20. However, the other course record is held by player who was even younger. Opening in 2002, the Par 3 Course at StonyCreek is 12 years younger than the Championship Course. 12, that’s the age Josh Keating was when he shot the lowest round recorded on the Par 3, a 6 under par 21. That summer, Josh and his father were frequent visitors on the 9 hole course. Josh was a rapidly improving young player, and his scores on the Par 3 were improving each time. When his Dad came in one day and said his son had fired a 21, my first reaction was skepticism. That seemed nearly impossible for anyone, not mention a kid, but it was true. Many golfers tend to think that a Par 3 Course is inherently easy, but that is not the case. For example, the golf professionals at StonyCreek have thrice played 100 hole charity marathons on the course. That’s a total of 44 rounds, and the best either has mustered is 25 and we’re grown men who do this for a living. Josh is now member of IPFW Golf Team and still a very fine player. Kyle and Josh’s scores and stories are inspiring not just because they are records or because of their young age. They represent why all of us play this game. Whether it’s a tournament or just and summer afternoon with family and friends, we all have visions of a record when we put the tee in the ground on the first hole. For most of us it’s not a course record, but personal one. Every round could be the one where it all comes together and we have the best game of our life. It doesn’t matter if that means a under par or under 100. The promise of that achievement drives us to the course day after day, and is a phenomenon unique to golf. It’s game that can’t be won, only played, and once in a while it’s played at a record level. Why is there a line at the course on a cold day? Why are people standing in line at the golf course on a cold day? Over the past few years, the first Saturday in March has become a busy day at StonyCreek Golf Club; however, there have only been 5 total rounds played over the last ten years on that day. So, why do people line up at the course on a Saturday when nobody is playing golf? It is junior camp sign up day. In 2005, brothers Bill and John Van Valer began offering summer junior golf camps through StonyCreek Golf Club for ages 7-12. A similar program had been conducted by golf professional Chuck Castor in previous years but was run as an outside entity that hosted its event at StonyCreek. In 2005, Bill and John set a goal of filling 80% of the available spots for the 4 weeks golf camp was offered, but by the time each week started all camps were full at 24 golfers. When information was published and sent out for camps in 2005, we said enrollments would not be accepted prior to March 1st. This was mainly to simplify record keeping so we didn’t have enrollments trickling in throughout the winter. Fast forward a few years, and families began to mark the beginning of March on their calendars to sign up their junior golfer for camp. By 2009, some of the weeks were sold out before the end of the day on that first Saturday in March, and in 2010, there was a line at the door before the course was open that morning. We have since adjusted the curriculum and staffing to allow for 32 golfers per week, and only accept enrollments in person for the first hour of sign up. It has never been our goal to make parents stand in the cold in on a Saturday morning in early March, but the demand over the years has forced us to find the most fair and equitable way possible to ensure everyone has an equal chance to participate in golf camp. It must be a pretty good, right? 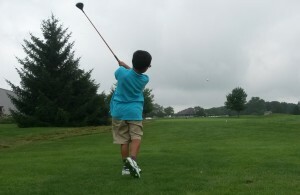 We are obviously biased, but yes, the StonyCreek Junior Golf Camp is Great! StonyCreek’s owner Sam Taylor, had the vision to add a Par 3 golf course to the facility in 2002, and that is an integral part of Junior Golf Camp. 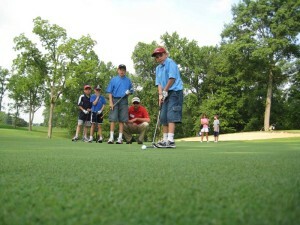 It provides the ideal setting for young players to learn the game and not just the swing. Do we teach the swing too, of course, but it’s GOLF camp and not swing camp. We want kids to leave their week with us with an excitement for playing the game of golf, not just a knowledge of how to hit a ball. In addition to a great facility, the other factor that makes StonyCreek Junior Golf Camp terrific is the staff. The Professional Golf staff is supplemented with a staff of energetic people whose experience and ability to work with kids is valued over their golf skills or knowledge. We’ve had many great camp councilors over the years, but our favorite was our Mom. A middle school art teacher for 37 years, she taught us a lot about how to connect with and manage a group of 30+ 7-12 year olds. 2016 will be the 12th year Bill and John have run Golf Camp at StonyCreek. At four camps a year, that means by the end of July, we will have spent 48 weeks of our life teaching golf camp. We couldn’t do that if we didn’t enjoy it immensely, and we hope our excitement for the game can be transferred to a few kids along the way. Our goal is not to create the next Speith or Fowler but hopefully a group of kids who will find a game to enjoy for the rest of their life. So that’s the story of why the first Saturday in March at StonyCreek is a busy day, even if a golf shot is never struck. And to all those parents who have stood in one of those cold lines over the years, we thank you very much for your support, the opportunity to get to know your kid, and the chance to help them learn and grow in the game we love. StonyCreek Golf Club will be doing something in 2015 that it has never done since opening in 1990. We will sell beer in the snack bar on a daily basis in addition to our normal food and beverage options. While StonyCreek has always maintained a beer & wine permit, we chose only to offer alcohol during private events. The choice not to make it available everyday was based on the Taylor family’s long history in the industry dating back to the 1930’s. They had experienced doing it both ways and settled on not making alcohol a part of their course when StonyCreek opened. We know this made us the exception when compared to other courses, and for some golfers was a mark against our facility. While StonyCreek has prospered with our current policy, after 25 years, we are trying something different. State Law still prohibits bringing outside alcohol on to a licensed facility, and this practice will continue to be disallowed at StonyCreek. 2015 will be our trial run for what is fundamental shift for us on this issue. It is imperative to us that StonyCreek remains a family & golf friendly atmosphere. Please help us maintain this environment moving forward, but also feel free to grab a cold one during or after your round if you are so inclined. What’s the deal with all those trees? The most common question when golfers finish their rounds the last few weeks (other than the typical compliments) is what are you going to do with all those trees that are marked? Answer: all the trees that are marked will eventually be removed. The vast majority of the trees marked on the property are ash trees and cherry laurels that have been affected by the Emerald Ash Borer, and are now dead or dying. You’ve probably heard about the Emerald Ash Borer on the news or in a newsletter from your homeowners association. The insect is a native of Asia and made its way to North America via wooden shipping containers sometime around 2002 in the Detroit/Windsor area. 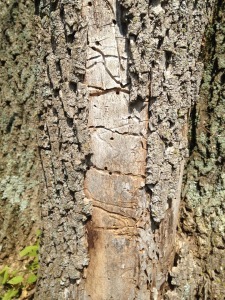 Since then, they have spread around the Midwest and taken their toll on ash trees. They eat away the area under the bark and eventually starve the tree of nutrients. We had seen some signs of the Ash Borer in the last couple years, but by this fall it became very evident which trees were affected and the extent of the damage. So what’s the next step? We discussed trying to save a few of the afflicted trees, specifically the ones behind #3 green, #11 green, and left of #12 green. These in particular helped frame the holes and give some depth perception when looking at the green. There are different theories on the best method to stop the insect once it has begun its attack on a tree. However, none of these methods are yet to be proven effective over the long term. 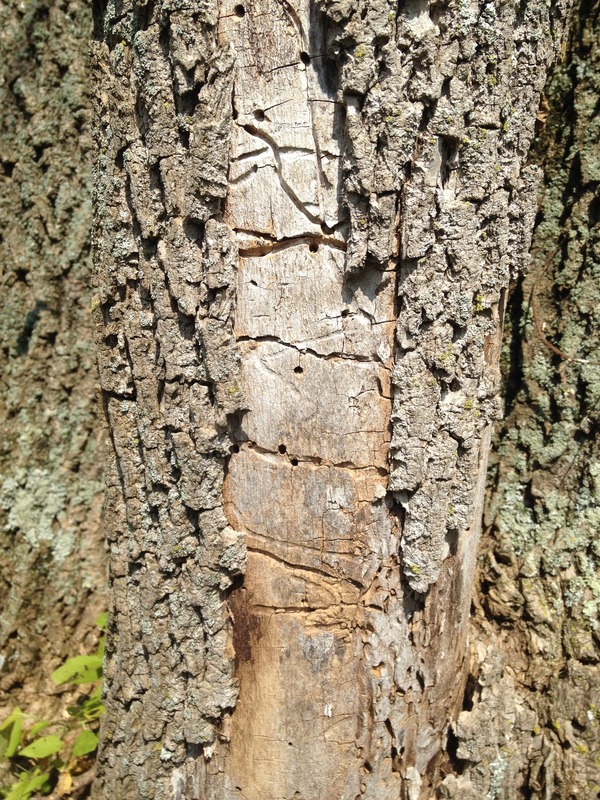 In addition, most of our ash trees deteriorated too fast for us to take action against the Ash Borer. That leaves us with only one option which is removal. 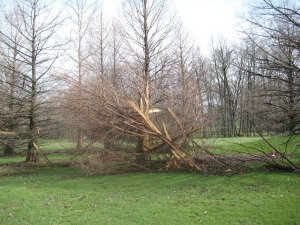 A large portion of the trees will be taken out this winter, starting with any that could pose a potential danger to golfers. Overall it will probably take a couple years to remove all those that have been afflicted. It’s always a shame to lose a tree; however, most of the ones that will come down will have little to no effect on how the course plays, and in many cases it will help the health of the turf (The right side of #15 and the left side of #18 will benefit from less shade). In a few cases, there will be some rejoice (the tree at the front left of #3 fairway has spoiled many drives over the years). 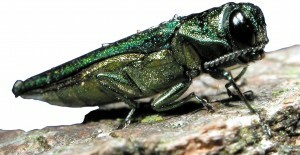 In all, the Emerald Ash Borer will eventually change the landscape of StonyCreek just as it has in other parts of Indiana. But that’s how things go when a golf course has been around for 25 years, some trees grow bigger, some come down, some grab your ball and never give it back, and some throw the ball right out to the middle of the fairway. All golfers have at some point in time been seduced by the infomercial, new book, and DVD series that claims to have once and for all figured out this game of golf. This one individual has unlocked the mystery that nobody else has since a few Scots started whacking a ball around their fields. Have you ever noticed that this so called secret always comes in one of two packages. The first one is what I like to call the Curley approach. Jack Palance’s character of Curley in City Slickers enlightens Billy Crystal that the secret to life is this “One Thing”. So to, do the late night pitch men and infomercial instructors. If you can master this one thing, you’ll never hit a bad shot again. It sounds silly doesn’t it, but the pitch is so simple you think, “I can’t afford not to try this”. And Boom, you now own some piece of plastic your supposed to swing for an hour a day and all you swing problems will go away. After that doesn’t work you stick it in the closest with your ShamWow, Snuggie blanket, & Shakeweight. Why don’t these products and methods work? Because the golf swing is more complicated than the “One Thing”. So I guess that means that according to wise old Curley, golf is more complicated than life itself, and that’s where the second type of “revolutionary golf instruction” comes in. The other package used to sell us on helping our game is the Einstein approach. This method aims to tell you how feeble your golf mind is and that the game is so complex that no mere mortal brain could understand it, let alone actually play the game effectively. These pitch men claim that without access to their vast expertise, you will never find any success in golf. This approach has brought us 20 session private lesson series, 500 page books on putting, and DVD Series with more discs than a Ken Burns documentary. The innovator and possibly still king of this methodology is Homer Kelley’s The Golfing Machine, a book so intricate it comes with instructions on how to read the book itself. Golf Professionals tend to like this approach because we can make money off of our infinite wisdom of the mystical golf swing. Much like the Curley sales pitch, the Einstein marketing makes since when you’re watching that infomercial at 2:30 in the morning re-living that day’s bad shots. But alas, you never finish the 1000 page dissertation by the self-appointed golf PhD, and it goes in that same closest with the gizmo that seemed so simple it couldn’t fail. So what’s the answer? Like so much in life, the answer lies in between the extremes. Is that “One Thing” out there? Nope, if it was, someone would have found it. After all, golfers are pretty good at searching, just ask your buddy that finds a 20 year old Top Flite in 10 acres of dense woods. As for the Einstein theory, we’ve all known someone who’s never had a lesson or read any books and articles but could still hit the ball a mile and beat us on any day. So here is the answer, the secret to golf…………. Take a lesson or three from a qualified instructor, and then practice and practice what they teach you. Think of shooting free throws. Someone shows you the basics, and then you shoot hundreds of shots. You don’t make them all, but with some basic instruction and plenty of practice you start to make a lot more than you miss. There it is, the secret to golf. Not singular but not infinite. Kind of makes for a bad infomercial though, I guess we’ll need some fancy graphics and some price drops. While we work on that, just go out and play and have fun, and if you need help at 2:30am, email (don’t call) your friendly local golf pro for a lesson. We all know that being outside during a storm with lightning can be dangerous, but how frequent are actual lightning strikes? You often here the chances of being hit compared to that of buying a winning lottery ticket. However, there are some places that payout more than others. 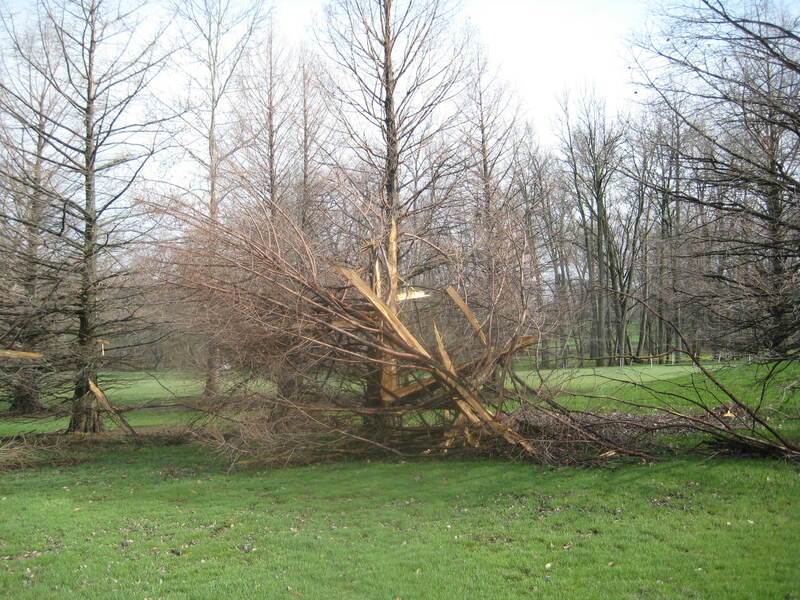 Take a look at this picture of trees in between holes 7 and 15 on the Championship Course at StonyCreek. That Ball Cyprus tree took a direct hit early this April, and from the looks of it you wouldn’t have wanted to be anywhere within a Bubba Watson drive of it when it got zapped. So how random was this strike. Well the biggest tree in that particular grove of Ball Cyrpus’ (the one on the corner of #15) has been hit not once but twice by lightning. Amazingly, it has survived both and still protects the left side of the hole today. So that’s at least 3 lightning strikes in one area that’s no bigger than a putting green. Given the lottery metaphor, that would be like three jackpots being sold from the same gas station. If that happened there would be a line out the door everyday of people buying Powerball quick picks. So maybe those lightening chances are a bit more likely than that big money payout. That being said, when the siren at the golf courses blows, don’t finish that hole, hunt for your ball, or take cover (especially under the trees on 15) because you might be luckier than you think. The smart money is on heading directly to the clubhouse. P.S. My favorite golfer comment of all time was when a group was asked why they didn’t heed the first siren on the course. They’re response “Well we thought that was Sagamore’s (the course directly across the street from us) siren. Yep, the lightening was only striking south of 166th street that day. It must have a membership at Sagamore.